that have come my way and have since gone to new homes. 6.5 x 3.5 x 2.5 cm. This is one huge Vanadanite crystal. Complete all-around. This was the first mineral specimen that Cal Neva Mineral Company sold. Thanks Rob. 5 x 4.2 x 3.9 cm. 5 x 5.5 x 2.5 cm. This specimen features super lustrous crystals of Heulandite to 1.8 cm. perched on a mound of Mordenite. This specimen was featured on mindat.org as specimen of the day on May 16th, 2007. 7 x 7.5 x 3 cm. 10 x 6.5 x 2.5 cm. This specimen was in my collection and took first prize for best mineral specimen from San Diego County at the 1997 San Diego County Fair. This one died a premature death when my brother Mike dropped it & then accidentally stomped on it. 4.5 x 3 x 4.2 cm. 8 x 7 x 5.5 cm. I picked up a couple of dozen of these at the 2003 Tucson show. Tourmaline in Quartz is a common mineral association but I think these Sapo Mine specimens are better than average. The Quartz crystal is on a mass of bluish-green Tourmaline. It is also a double terminated scepter and is loaded with green & blue Tourmalines to the point that it looks like there was a Tourmaline explosion inside of the Quartz crystal. There are so many Tourmalines that they stick out of the crystal on almost all of the faces. There are also several large bluish-black Tourmalines on the rear of this specimen. This specimen is almost a floater, with just a small area of contact on the right side of the specimen. 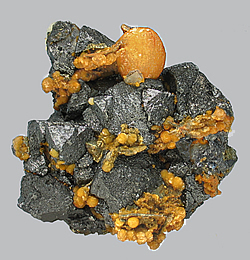 This is one of the specimens mentioned in Luiz Menezes' article on the Sapo Mine that was published in The Mineralogical Record, volume 40, #4. 8.5 x 5 x 3 cm. The Comstock Lode achieved fame for the enormous volume of Silver that was mined there during the 1800's. 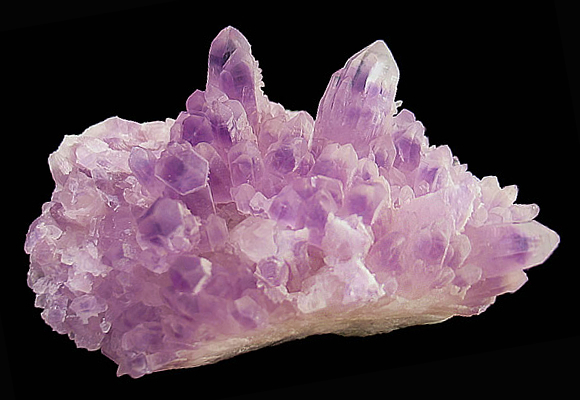 Very few examples of the silver ore specimens or other associated minerals such as this Amethyst specimen were preserved. While single crystals are occasionally found on the mine dumps & surrounding hills by local collectors; it is indeed a rare occasion that an intact plate of crystals such as this one is found. Often referred to as “Potato Stones” by the local collectors because the outer portion resembles a potato. Although there are many of these to be found in the hills & surrounding valleys, these geodes are almost never seen for sale. This is due to the fact that the main deposits are either located on private property or in quarries. Making it almost impossible to collect specimens. specimen size 4.7 x 4.9 x 4.6 cm. crystal size 4.4 x .8 x 1 cm. Of all the miniature sized Aquamarine matrix specimens that I've seen, this one has made the biggest impression on me. It's got a lot going for it. 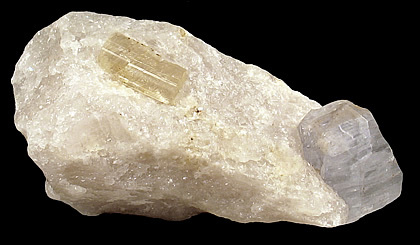 A big blocky, partially dissolved Feldspar crystal (I'm not sure if it's an Albite or an Orthoclase) with an aesthetic sky blue double terminated Aquamarine that has a very gemmy upper half, majestically perched on its front face and at the point where it becomes less gemmy is a nest of hair like Schorl crystals. And, to top it all off, the Aquamarine is a scepter. Not one of those crystals with the lower portion dissolved away that are called scepters. This is the real thing. The lower termination has the same hexagonal shape as the upper portion of the crystal. Specimen size = 10.6 x 5 x 4 cm. Richterite crystal size = 2.5 x 1.3 cm. Sodalite crystal size = 3 x 3 x 2.6 cm. This specimen is one of the more unusual mineral associations that I've seen from the Badakshan Province of Afghanistan. Every time my Afghani connection comes back from a trip to his homeland, he always has something new and unusual from this province. This time it was this stunning specimen you see before you. 7.4 x 5.2 x 3 cm. This extremely lustrous and gemmy, etched Topaz is from the small find made in 2004 and features a jacket of Lepidolite covered with Cookeite. 4.5 x 1.3 x 1.5 cm. I showed the photos of this specimen to my friend Michael, who was the former owner of this incredibly gemmy Tourmaline crystal. His response was; The pictures do all the talking for this juicy specimen. I agree with him, the pictures do say it all. It is an incredibly clear Tourmaline. 3.5 x 3.6 x 3.4 cm. A very cool concretion of Pyrite, crowned by a cluster of cubic crystals. These Pyrites are comprised of SEDEX (sedimentary exhalative deposits) ore, similar to the black smokers of the South Pacific. After having weathered out of their matrix, they washed ashore on the beach at Piccadilly, which accounts for the slightly water-worn appearance. 5.1 x 3 x 2.5 cm. This classic double-terminated Elbaite Tourmaline exhibits a modified hemimorphic form. The color-zoned portion of this Tourmaline is much clearer than it appears here. It grades from a light olive-green to light green to pink to blue-green with an extremely thin darker green layer on the termination. While the other half is a combination of pink and red. This crystal is a floater, there is no point of contact on this crystal. Good Himalaya Tourmalines of this size are scarce these days. While sporadic work is being done at this mine, pieces such as this are not being found. These will only get more difficult to obtain in the future. This specimen was obtained by Brett Beach from Irv Brown's personal stash of self collected Himalaya Tourmalines in 1998. 7 x 4 x 5 cm. This specimen features a multitude of very lustrous, reticulated sixling-twin crystals up to 1.5 cm. Iranian Cerussite specimens are extremely hard to find and in my opinion are every bit as good as those from Tsumeb. 4.5 x 3.5 x 3.2 cm. 6 x 4 x 1.5 cm. This incredible mineral specimen features the variety of chromium Garnet known as Uvarovite, which was named after Count Sergey Semeonovich Uvarov. The Uvarovite crystals are partially embedded in a nest of lavender crystals of the mineral Amesite, making for a pleasing contrast of colors. This specimen features Uvarovite crystals measuring up to 3.5 mm. which is considered to be larger than average for this species of Garnet. 12.3 x 4.6 x 3.3 cm. Here we have a superb example of Serandite, the signature mineral from Mont Saint-Hilaire. This log-like Serandite specimen features an assemblage of minerals which include: numerous white Natrolite crystals to 2.3 centimeters; several Analcime crystals, the largest of which measures 1.5 centimeters; many splendid, richly-colored rosettes of Rhodochrosite crystals; a pair of grayish tufts of the extremely rare beryllium hydroxide mineral Behoite, one of which can be seen on the lower portion on the rear of the specimen, as well as the ever-present mineral, Aegerine. This mineral specimen is a veritable all-in-one representative suite of Mont Saint-Hilaire minerals. Large Serandite crystals are hard to obtain these days, even more so, one with such a variety of associated minerals. 12.8 cm x 7.3 cm x 5 cm. This peculiar polyhedroid Agate specimen is from Paraíba, Brazil which is famous for its distinctive Blue-colored Tourmaline due to their high Copper content. These remarkable Agates were first found in 1974 by Odwaldo Monteiro and are all but impossible to obtain these days as the supply has been exhausted for many years. These anomalies of the Quartz family are occasionally seen for sale as polished slabs. It is rare that an intact example is seen for sale. I've done quite a lot of research trying to determine how these mineral oddities are formed. There are many hypotheses as to how these are formed. However, in the course of my research I have found that no two theories are the same. So just enjoy these for what they are, a most unusual Agate specimen. This specimen was featured in John S. White's article on Quartz Polyhedroids published in the May/June 2014 issue of Rocks & Minerals. 12.4 x 11.2 x 5.1 cm. A large specimen consisting of ocher-yellow Stilbite crystals. These Lustrous crystals are interwoven with each other on their matrix. The crystals on this specimen measure up to 3 centimeters. This specimen is very 3-dimensional; more so than the photograph conveys. These hard to find specimens were collected by the staff of the Fersman Museum on an expedition to this remote area some years ago. 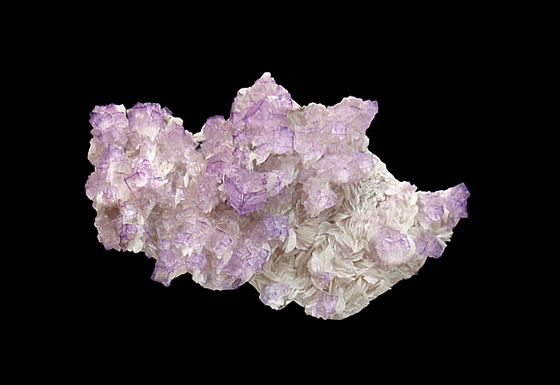 While Illinois is the undisputed king as far as Fluorite from the U.S. is concerned, its neighbor to the south has been known to produce the occasional specimen. This specimen features cubes of light-purple-colored crystals of Fluorite measuring to 1 cm perched on a matrix of bladed crystals of Barite. While seldom seen at the best of times, Fluorite specimens from Kentucky have always been eagerly sought out by collectors. This specimen came labeled as being from the Irvington Quarry which is the former name of Liter's Quarry.